See what you have been missing thanks to 170-Degree of even light dispersion that goes where you do. Whether your work takes you under a cabinet or crawlspace, or to an attic or the outdoors, the SysLite's robust build and shock-resistant body is easy to carry and designed to perform when you need it most. Six high-efficiency, LED bulbs will provide even, consistent light for up to four hours on a single charge, longer when paired with a Festool battery, and without interruption when plugged directly to a power source. Compact and Rugged-Built to handle the toughest you can throw at it, the SysLite features a rugged case and nearly indestructible LED lights, so you won't ever have to worry about breaking or replacing bulbs. 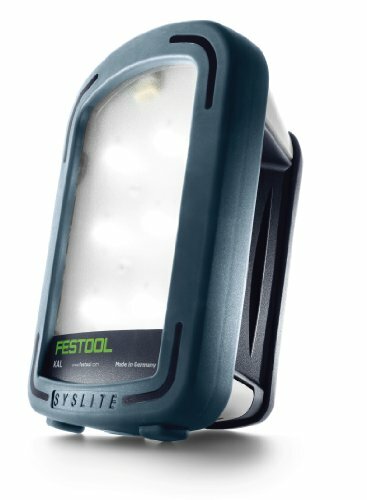 Unbelievably Bright-The SysLite delivers an even, balanced light source, casting a brilliant and consistent white light, so you can examine the smallest details in close quarters, or take a few steps back to look at the big picture. Multiple Power Options-The SysLite features a long-lasting internal battery as its main power source, but can be easily charged or run with the included wall and car chargers, or used with a compatible Festool battery as an auxiliary power source to the internal battery.